Samsung has been talking up a trio of new desktop monitors ahead of this year's CES in Las Vegas. 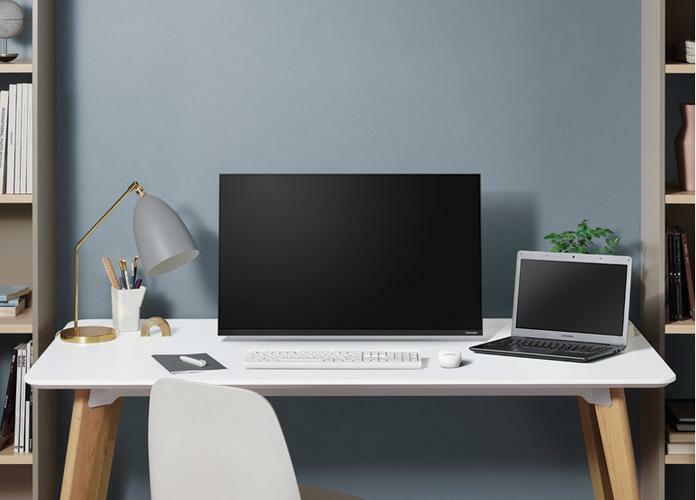 “Samsung’s latest monitor lineup is incredibly versatile, and demonstrates our commitment to continued innovation and leadership in the category,” said Seog-gi Kim, Executive Vice President of Visual Display Business at Samsung Electronics. Each of the three high-end desktop display products are aimed at a different kind of enthusiast user. The new Samsung Space monitor features a fully-integrated arm that clamps to the edge of your desk, freeing up valuable space. It's available in 27-inch and 32-inch sizes, with the former boasting QHD resolution and the latter arriving in full 4K UHD. Then, the new Samsung CRG9 is a premium gaming monitor that Samsung claim is the world’s first high-resolution super ultra-wide gaming monitor with 32:9 aspect ratio. It's a huge 49-inch beast of a display with a 120Hz refresh-rate, 4ms response time, dual-QHD resolution plus both HDR10 and AMD Freesync support - the CRG9 is the plus-sized display that's got literally everything (minus G-Sync, obviously). Last but not least, there's the Samsung UR59C. The UR59C is a slim, curved, 4K monitor with envisioned as the ideal option for content creators. It boasts a 2500:1 contrast ratio, 1500R curvature and 3840x2160 4K UHD resolution. No word yet on pricing and Australian availability for these new products but stay tuned for more info as we head into this year's CES in Las Vegas. Disclosure - PC World Australia's coverage of this year's CES in Las Vegas was sponsored by Intel and MSI who covered the costs of our flights and accommodation. For a full wrap-up of everything we covered at this year's CES in Las Vegas, click here.